Many of us are stressed out and over-burdened. It feels as if there's not enough time in our day. In our efforts to keep up with everything in our lives we become frustrated, unhappy and often times ill. Meditation seems like one more thing "to do" and there's no time to do it. The fact is, there won't be time for personal health and well-being if we don't stop for a few minutes to take care of ourselves. The benefits of regular meditation are documented in university and scientific studies worldwide. Meditation brings calm and focus to the mind. It relieves stresses in the body and allows inner peace to surface. Taking time every day to meditate will transform your life. Little by little as you become more centered, you will find more time in the day, not less, because your mind can focus and work more efficiently. You'll develop calm and a keen awareness of grace in the little things around you. With that ability to see those precious moments, your serenity and joy in life increases. Over the years people have asked me how do you meditate. Many feel meditation is a mystical secret known only to the spiritually advanced or to yogi masters. 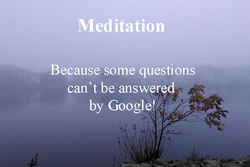 Then when you heard how really simple it was, you assumed it was not “real” meditation. Actually, meditation is very simple, but the impact on the life of someone who regularly meditates can be significant. * Make it the most important activity of your day. * Schedule it at the same time - early morning is best. Below are two simple meditation techniques with clear instructions. One is Zen Buddhist and the other is a practice that Yogananda taught his students. Choose one or the other and make meditation a daily part of your life. This first one is taught by Ananda Sangha. This group was founded by Swami Kriyananda, a direct disciple of Paramahansa Yogananda. This technique uses a mantra, Hong Sau, that was taught by Yogananda to his students. meditation instruction is taught as it is practiced at the Hazy Moon Zen Center of Los Angeles.